We’re the dream team. Sophia is a super creative rock star, Rose makes our Yoga classes challenging and fun all while Kelsey keeps the crazy train on its’ rails. At the Beer Fit Club we look for people that are as passionate about our mission as we are. We really are a family! The Beer Fit Club is proud to be female owned and managed. Rose discovered yoga in a hectic part of her life living in NYC. Yoga helped her press the reset button on life. 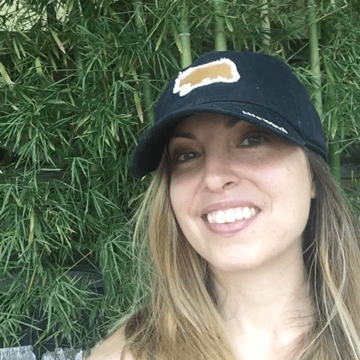 “I love that yoga has a way of bringing you back to what is important in life… focus on the simplest things that keep us going – like breathing or love.” Rose quickly realized she had a future in yoga and studied to become an instructor at Yoga Yama in Patchogue. Jill found herself when she discovered her need for fitness and health. 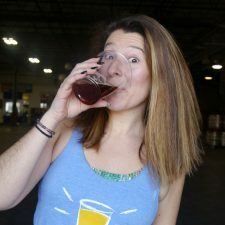 She started making more active choices and eating healthier but, little did you know, she never gave up her love for craft beer. She claims it is basically a hobby! A year down the road she has lost 35 pounds and couldn’t be happier. Jill decided to get involved with Beer Fit Club when she saw a video in a craft beer group that was inspiring, rewarding and seemed so fun! She knew right away that this is something she could fall in love with. 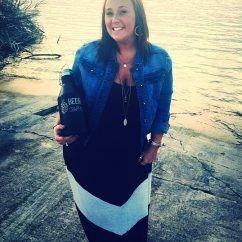 Jill resides in ATX as a part-time beer slinger and is a Realtor® by day with Keller Williams. She enjoys beer, sunshine, fitness & hoppiness. Emily Stewart is an insatiably curious multi-passionate writing fitness freak. 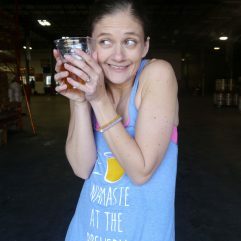 When she’s not teaching Yoga, Pilates, and Body Conditioning she’s writing about her favorite topics: yummy beer, daily delights, and life’s lucky mishaps. Find her @Tavour and @ahumandoing. People don’t know that Emily is a secret introvert– despite her super outgoing attitude, she loves quiet time! 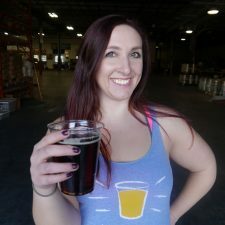 Emily’s favorite style of beer is YOUR favorite style of beer– she loves beer as a community-builder and conversation starter! I like to invite others to feel what they feel, and to think what they think, and to even take a step back and observe all of that without judging it. But now you may ask, how in the world did this lead to beer yoga? My favorite type of beer: Most recently, I really enjoyed “A Ship in Harbor” at Big Alice Brewing in LIC! Growing up I’ve always loved working out in a group because I loved the energy that bounces around the room. Taking kickboxing, HIIT, and yoga classes I felt like I found fitness classes that had personality. As for my beer journey. I used to think mass produced beers in cans were the definition of “beer”. However, while studying in Belgium I got to experience freshly brewed beer and ended up drinking beer most nights. Upon returning to the states I realized that there was more to beer than just the cans I’d find at a family bbq. So after my first Beer Fit Club yoga class it felt like the best of both worlds. 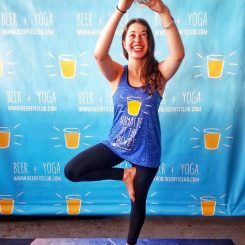 Freshly brewed beer and yoga with personality. What’s something people don’t know about me? 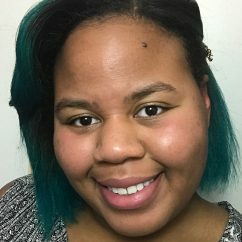 I haven’t worn my natural hair color over 7 years. Heather Holland is a yogi and freelance writer. Her passion for fitness grew when she broke her collarbone serving the US Army, where she developed a competitive drive to “out do” the boys. Though she believes you have to work hard to play hard, her love for beer did not develop until she was later immersed in cacao research. Heather’s favorite style of beer is a barley wine, or a porter —anything she can pair with chocolate. Something no one knows about Heather is that she likes to do at least one good deed per day, even if it’s just the act of making someone else smile. Laughter is preferred. She holds a 200 hr RYT certification from Black Swan Yoga and advanced study in yin-yoga. You can follow Heather on Instagram @huntingforchocolate.